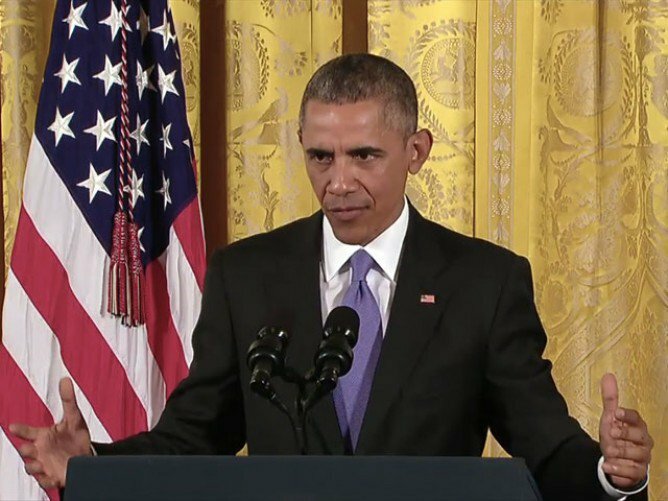 President Obama took questions on the deal with Iran in the East Room of the White House on July 15. President Obama was well into his feisty and freewheeling news conference on the Iran nuclear deal when Major Garrett of CBS News got under the presidential skin. The normally cool president reacted slowly, as though trying to control his anger. “The notion that I am content — as I celebrate — with American citizens languishing in Iranian jails?” Obama asked, icily. “That’s nonsense, and you should know better.” After that extraordinary scolding, the president went on to explain that he didn’t link the American captives to nuclear talks because doing so may have made Iran think “we can get additional concessions out of the Americans,” and would have made it “much more difficult for us to walk away” from a deal. Garrett’s question, though loaded, was legitimate; one of those being held on bogus charges in Iran is Jason Rezaian, The Washington Post’s Tehran bureau chief. And Obama’s answer was revealing: Full of Sturm und Drang, he ultimately acknowledged that the United States just doesn’t have the clout to enforce its will. This was an undercurrent of the whole news conference Wednesday afternoon, and of Obama’s overall defense of the Iran deal. He was tough and strong, but in service of the argument that American power is limited — that this is the best deal we could get with our declining leverage. His defenders call it realism; it also may amount to ratifying retreat. There’s little that Obama’s Republican critics in Congress can do about the deal other than vote their symbolic disapproval, and the president seemed to be speaking as much for the history books as for contemporary critics, using phrases such as “historic chance” and “future generations.” But mostly what came through was a defense of what future historians may describe as the Obama doctrine: an America that recognizes the limits of its power and acts less ambitiously. He’s right. And this is why it was, sadly, a powerful case — for American weakness.